The newest wine clubs are young, fun and focused on delicious, inexpensive bottles instead of prestige labels. 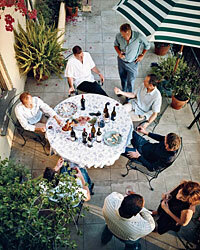 Here, F&W's Ray Isle profiles one great L.A. group and tells how anyone can join in. One difficulty with having your monthly wine group meet on your terrace is keeping your dog from eating all the soppressata. That's what Stephen Tseckares, a vice president of programming at E! Entertainment, is discovering at the fall kickoff meeting of the officially-as-yet-to-be-named, greater Los Angeles, mostly-guys-whose-kids-go-to-the-same-school wine club. As Tseckares uncorks a bottle of Central Coast Syrah, the dog, a former stray named Eliot (after George), makes a deft bound onto one of the patio chairs around the table where the snacks are, then an equally deft bound off. Only momentarily distracted, Tseckares holds up the bottle. "Okay, next wine. Léal Vineyards San Benito Syrah—anyone know where San Benito is?" He pours quarter glasses of the almost purple Syrah for the eight other members of the group. The men are mostly in the entertainment business: screenwriters, producers, executives. Today they're comparing California Syrahs and Australian Shirazes; the same grape from two different continents. A lineup of 10 bottles—the Léal is the third—waits on a side table. "What's the alcohol on this?" asks Scott Sturgeon, an independent film producer and screenwriter. "Only 14 percent," Tseckares says. "Perfect for a hot day," Sturgeon responds dryly. "The Eberle's 15," says John Tomko, also a producer, referring to a single-vineyard Syrah from Paso Robles with a peppery, Rhône-like elegance. "All I can say is thank God you didn't make us do Zins again," Sturgeon says to Tseckares, who laughs—and keeps pouring the Syrah. Tseckares's group is characteristic of these new clubs. A good percentage of the members are fairly new to wine, and their interest is half vinous and half social. Nevertheless, the group is intent on the wines at hand, and conversation stops whenever Tseckares announces what the next bottle is going to be. The Syrah/Shiraz theme this month came about partly because the group was curious to answer a basic question—given that Syrah and Shiraz are the same grape, what's the difference between the wines? After the Léal, the next two wines come in quick succession, with any excess left in the glasses getting dumped into a pitcher in the center of the table. (No one intends or is expected to drink everything that's poured.) The fourth of the California wines is a 2002 Paige 23 Syrah, from a boutique producer in Santa Barbara County; it's more aromatic than the previous bottlings, almost gamey, with inky, intense flavors. John Tomko, who brought it, is not impressed, but several other people like it. Then comes a 2004 Jaffurs Santa Barbara County Syrah, big and black, and, by general consensus, a bit over-the-top. These bottles are all findable and affordable; the group almost always sets an upper price limit of $25 per bottle. Partly this is because before founding this group, Tseckares was in another wine group, mostly men in their fifties and sixties who were, he recalls, serious collectors. "Some of them had been collecting wine for 25 years. Some of them, their fathers collected wine. There were guys bringing $1,000 bottles to these tastings." Of course, tasting $1,000 bottles of wine isn't an unpleasant activity, but it does tend to be a much more serious one. And, as Tseckares recalls, "Every single time, it was Cabernets or Bordeaux. Trophy wines. But my feeling is I wouldn't mind doing Greece, for instance." Once the Syrahs are done, the group moves on to the challenger, Shiraz. As they taste, the men snack on the charcuterie and cheeses that Tseckares's wife, cookbook author Jessica Strand, has procured from the Cheese Store of Silverlake. Of particular interest, partly because it goes so well with the wine, is a soft truffle cheese called Sottocenere, insanely rich and insanely delicious. "There goes my cholesterol," jokes Chris Reed, an actor turned screenwriter, helping himself to more. "That's why you only do these things once a month," replies Peter Baxter, a founder of the alternative film festival Slamdance. Once people taste all 10 wines sequentially, they go back to the ones they are particularly interested in, tasting back and forth between bottles. The men find the Shirazes, from Hill of Content, Winner's Tank, D'Arenberg and Barrel Monkeys, to be generally more fruity, a little more ebullient and a little less subtle than the Syrahs; the consensus winner among them, the 2004 Winner's Tank from Langhorne Creek in South Australia, carries an enormous abundance of ripe blackberry fruit yet somehow manages not to feel overblown or jammy. Overall, though, the American wines—particularly the 2003 Eberle Steinbeck Vineyard Syrah—come out on top. Tseckares disappears, then reappears a half hour later, barbecue tongs in hand. "Gentlemen," he says, "upstairs there is meat. I suggest you go up there, grab a plate and fork and get started."